Local private sector development stands for the ability of developing and emerging countries to create decent jobs and rising standards of living for all their citizens. It is the main engine of poverty reduction and the basis for the sustainable provision of public goods and services. Access to decent jobs is vital for social inclusion, not least for young people that usually bear the brunt of unemployment. However, local private sector development faces many hurdles. In developing and emerging countries the barriers faced, particularly by small companies, are made even more severe by greater levels of economic uncertainty and underdeveloped financial sectors. For people on low incomes, particularly women who face heightened economic exclusion, access to credit and other financial services can be an important enabling factor in escaping poverty and achieving greater well-being and empowerment. 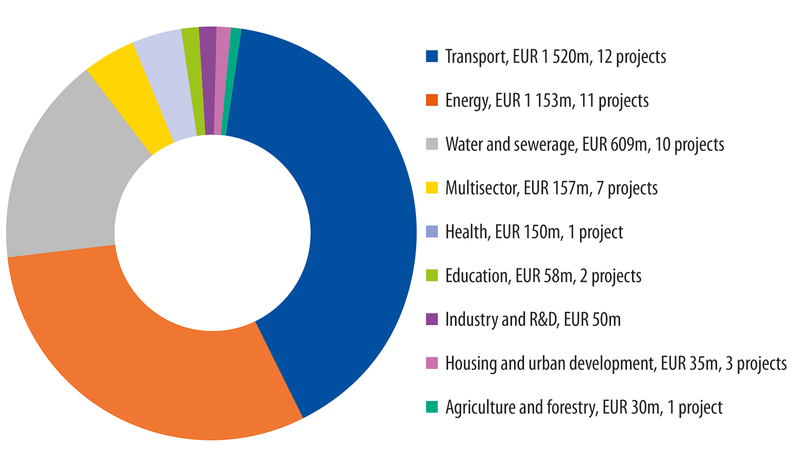 Total EIB commitment in 2017 (new projects) to local private sector development outside the EU was EUR 3.405bn. 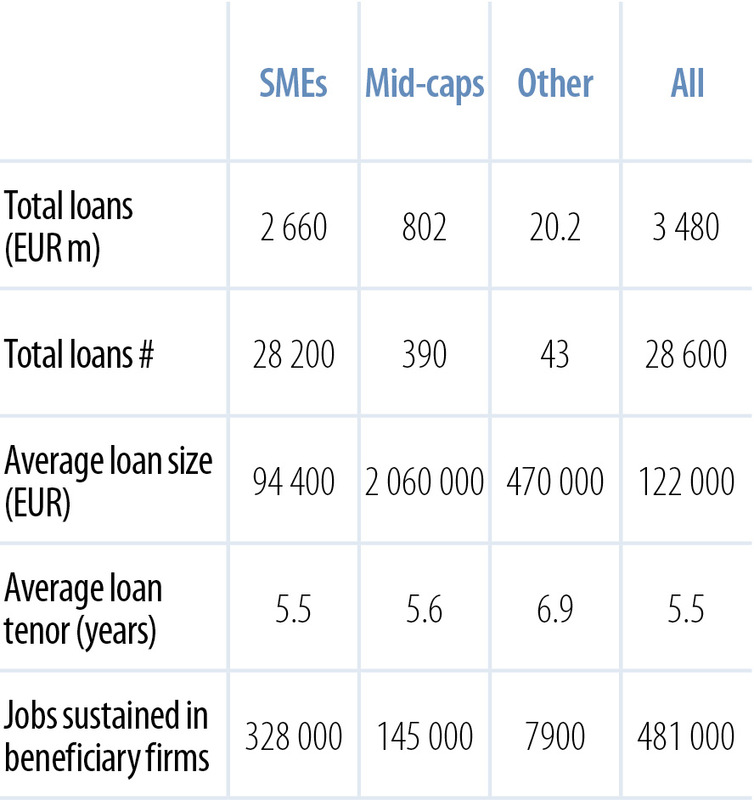 Credit lines and guarantees in support of SMEs and mid-caps – 2017 saw a reduction in both the number and total volume of new credit lines, largely due a slowdown in activity in Turkey were the Bank has long provided very extensive support to economic convergence with the EU. Another development in 2017 was the more extensive provision of portfolio guarantees, with five guarantees provided to banks in Ukraine, Georgia and Moldova. Guarantees support lending to smaller business by absorbing a proportion of the risk involved, making this lending more attractive for intermediaries. 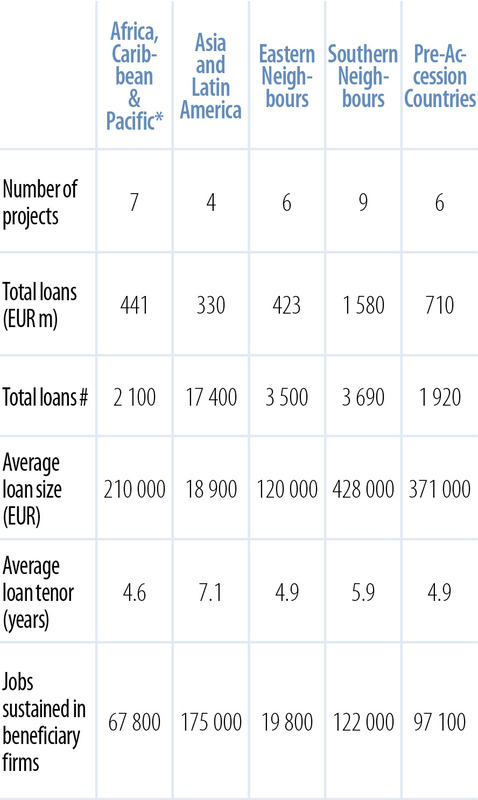 The volumes involved for the EIB are typically smaller than for credit lines, but while credit lines are onlent to beneficiary companies on a one-to-one basis, guarantees serve to trigger a higher degree of lending through risk-sharing. Taken together, new credit lines and guarantees in 2017 will enable local intermediary banks to make more than 28 000 loans, averaging around EUR 122 000 each. The average size of final beneficiaries is expected to be just under 17 employees. This figure is notably influenced by the Kyrgyz Agriculture and Food Value Chain credit line that is expected to target some 16 000 enterprises in the agriculture and food sectors, but even excluding this project, the average beneficiary company is “small” with 34 employees. These credit lines and guarantees will also allow local banks to extend the duration of the loans they offer to SMEs and mid-caps. The average loan tenor (weighted by loan size) is expected to be 5.5 years, substantially more than small companies can typically access in developing economies. It is expected that these credit lines and guarantees will help sustain some 481 000 jobs in final beneficiary companies. Credit lines for microfinance – While standard credit lines to banks for SMEs support lending to very many microenterprises, credit lines for microfinance specifically target microfinance institutions that are themselves specialised in extending credit and other essential financial services to the poorest groups in society, and often with a particular focus on women and vulnerable groups. Six microfinance credit lines support the local private sector development objective. 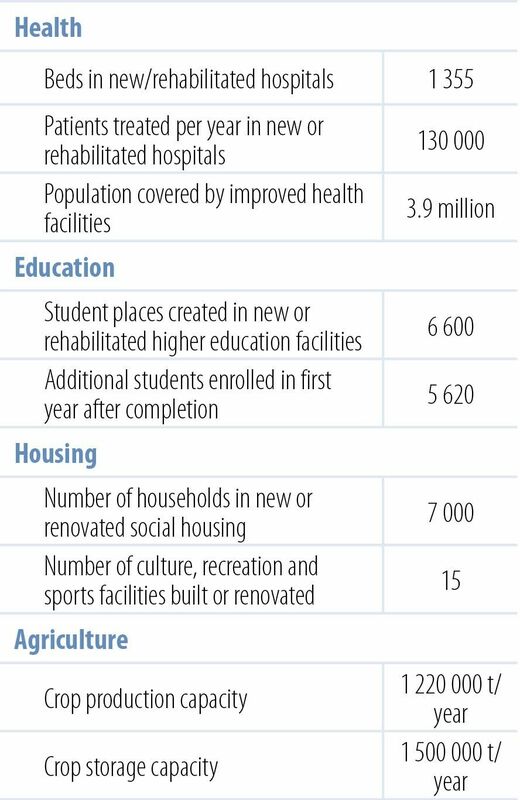 A seventh supports social infrastructure development, reported under education. 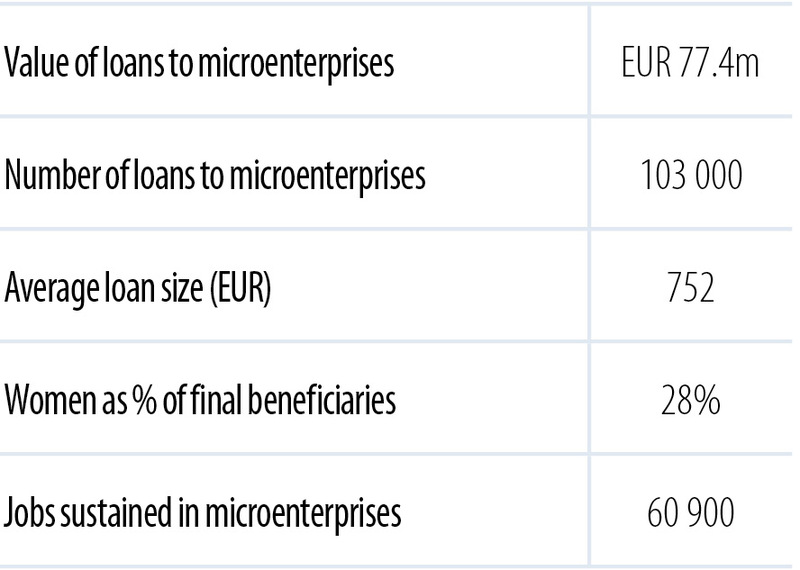 Together these projects will support over 100 000 loans to micro-entrepreneurs, with an average expected loan size of EUR 752. Because it is assumed that microfinance clients are usually micro-entrepreneurs (one job per loan) and likely to benefit from repeat loans throughout the life of the credit line, the total jobs sustained by these loans is conservatively estimated at 60 900. The EIB also invested in the Shorecap 3 microfinance investment vehicle. This helps this fund to catalyse further resources to support an expected 15 microfinance institutions, which together lend to some 400 000 beneficiaries. Equity funds – The EIB supported 11 equity funds to help direct risk-absorbing equity finance and technical advice to companies with high-growth potential, in turn giving a spur to growth and job creation. While most are in Africa, three are in the Southern Neighbourhood, representing renewed support for private equity funds in this region. 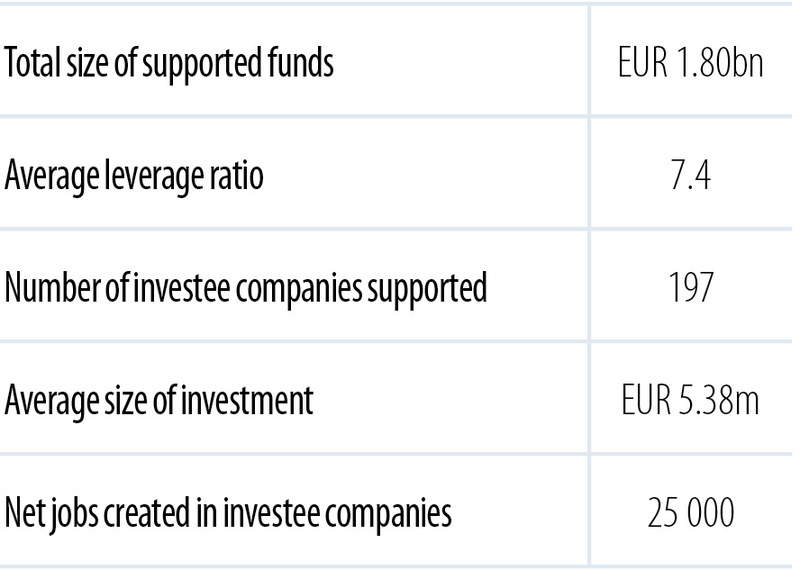 EIB participation in equity funds will help to catalyse total funding of EUR 1.8bn, which is expected to create around 25 000 jobs in nearly 200 investee companies. Industry and R&D – The EIB also lends or provides equity financing directly to larger projects by private industry where these make a significant contribution to local private sector development. In Ukraine, two projects support the development of the agricultural and food sector. Three projects in Tunisia and Morocco will support the further development of the manufacturing sector, something that is critical for creating high quality jobs in these middle-income countries. The Bank’s investment in M-Birr is an example of direct equity investment in a young company with very high potential development impact. We are also providing direct equity financing (a contingent risk-sharing loan) to BiondVax Pharmaceuticals, a start-up in Israel, to finance research and development for a new vaccine against influenza. The project entails the investments necessary to bring the novel vaccine to the market as a seasonal primer for elderly people, including clinical trials. By 2021, if successful, this project will enable the production of 10 million doses of the vaccine. Infrastructure is a vital pillar of the development process. It contributes directly to better lives as the basis for the provision of basic services such as safe water and sanitation provision, electricity supply, healthcare and education. At the same time, good infrastructure is an essential condition of economic and sustainable growth, creating decent jobs and raising standards of living. In 2017, the Bank signed 47 new infrastructure projects that represent total approved lending of EUR 3.76bn. 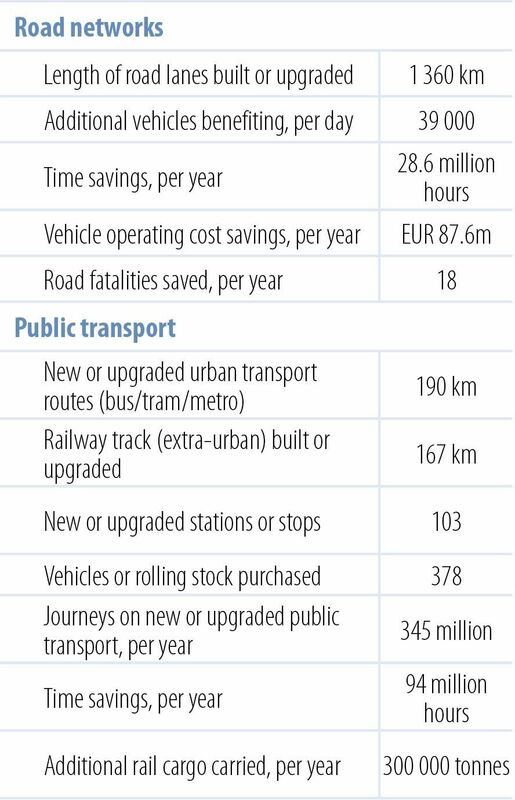 Transport – Six of the twelve new transport projects in 2017 are concerned with improving urban transport systems to tackle congestion, foster growth and improve urban quality of life, whilst keeping climate impacts to a minimum, such as the extension to the Metro in Bangalore, India. Five road projects will improve economically important transport links. The widening of 41km of the extremely busy Mombasa port access road in Kenya is expected to benefit the users of up to 38 000 vehicles a day, and bring much needed safety improvements. The EIB is also supporting road modernisation in Madagascar to help spur development in very underdeveloped regions through better access to ports. In the Western Balkans region, the Montenegro Railways 3 project will continue a programme on investment in the rail network to facilitate trade and growth, enabling an additional 300 000 tonnes of goods to be carried every year. Energy – Eight out of eleven new energy sector projects will develop new generation capacity from renewable sources, mostly in Asia and Latin America, but with one project – the Gulf of Suez Wind Farm project – in the Southern Neighbourhood. 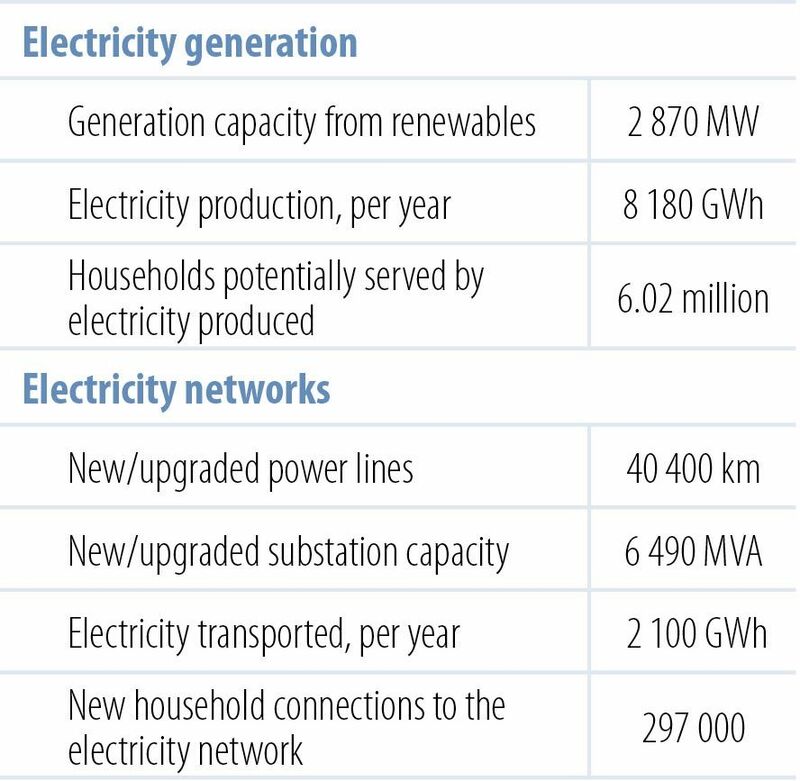 In addition, electricity generation from renewables will also be a major focus of the multi-sector China Climate Eximbank framework loan. Two more projects will expand and upgrade electricity networks in Moldova and Paraguay, improving the efficiency and reliability of transmission, while a project in Kenya is focused on extending access to the electricity network to further communities and households. 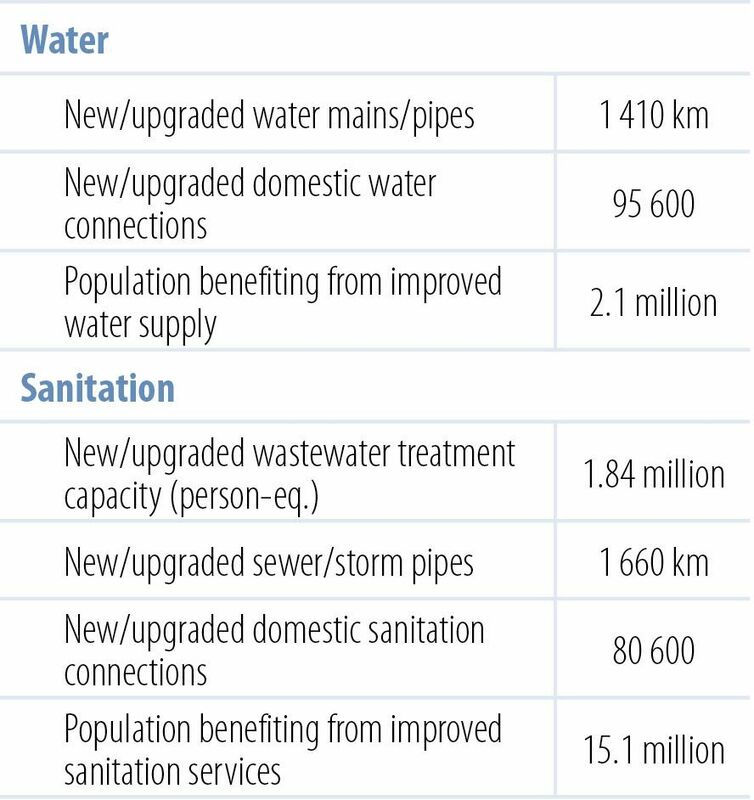 Water and sanitation – Eight projects in this sector will address the need for modern, efficient wastewater systems. The Tbilisi wastewater and infrastructure project is notable for its scope, bringing benefits across the Georgian capital city of 12 million inhabitants. The project will include the upgrade of the Soviet-era Gardabani wastewater treatment plant to bring it in line with current Georgian and EU requirements, and modernise the outdated water distribution and sewage collection networks to improve access, minimise leaks and infiltration, and save energy. The Programme National Assainissement 2 will similarly upgrade wastewater systems across a number of small and medium-sized towns in Morocco, benefiting 1.2 million people. Projects that will improve safe drinking water supplies include a major investment programme in Abidjan, Côte d’Ivoire, that will benefit nearly 1 million people, and a project of extensive modernisations of water infrastructure in Fiji. Health, education, urban development and agriculture – New social infrastructure projects include a project to build a new hospital campus in Bursa, Turkey, which will serve a population of 3.9 million, providing treatment to 130 000 people every year. The Université Euro-Méditerranéenne de Fès, meanwhile, will create 6 600 new student places. Investment in the International Housing Solutions Fund 2 will support the construction of 7 000 affordable homes. Two projects are framework loans that will be used to finance energy efficiency projects in the cities of Chisinau, Moldova, and Yerevan, Armenia. While the individual sub-projects are yet to be identified (and hence results have yet to be estimated), they are expected to focus on the renovation of public buildings in the cities. A further two projects support agricultural production, storage and processing capacity in Ukraine, something that is important for the development of the rural economy as well as for climate resilience. R&D and multi sector projects – The development of social and economic infrastructure is also served by seven projects that address a number of sectors. 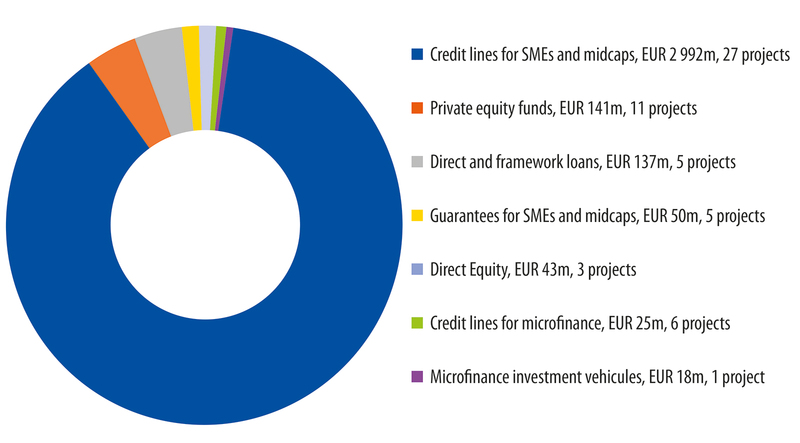 Three framework loans or funds support climate action projects in different sectors, while four credit lines targeting Montenegro and Serbia will be used to support both investments by SMEs and other local small-scale projects that meet local infrastructure needs. Two projects also contain R&D components: the Université Euro-Méditerranéenne de Fès and one agriculture project which covers the development of software tailored to managing agribusiness processes in Ukraine. Employment impacts of infrastructure projects – Overall, new projects in 2017 are expected to support 314 000 person-years of employment during construction. The Bangalore Metro Rail project in India in particular will have a strong impact on employment, creating 55 000 person-years of employment. The number of permanent jobs created during the operation of infrastructure is 8 680 jobs. 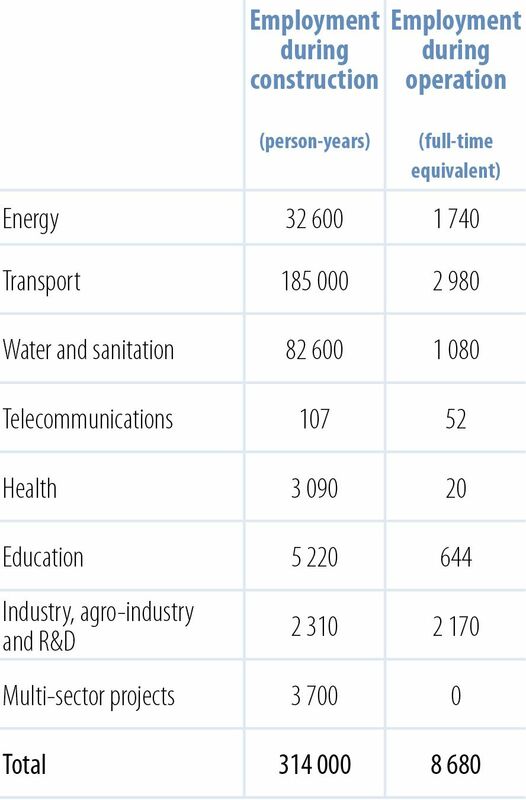 *Employment split by sector is indicative.